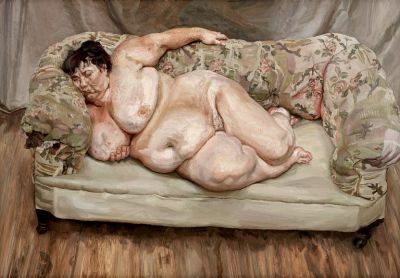 Lucian Freud is an artist. (New York, NY, January 22, 2019) — Acquavella Galleries is pleased to present Lucian Freud: Monumental, a loan exhibition focusing on the artist’s naked portraits, a subject that has long enjoyed special significance in his oeuvre. Curated by the artist’s longtime studio assistant and friend, David Dawson, Monumental will include thirteen major paintings, including depictions of his most important models from the 1990s and 2000s. The show includes important loans from the Metropolitan Museum of Art in New York, the Art Institute of Chicago, The Lewis Collection, in addition to other private collections. This will be the sixth solo exhibition over the course of Acquavella Galleries’ longstanding relationship with Freud and, since the artist’s death in 2011, his estate. The exhibition will be accompanied by a fully illustrated catalog featuring essays by Dawson and Michael Auping, longtime chief curator at the Modern Art Museum of Fort Worth, who interviewed Freud between May 2009 and January 2011. David Dawson was Lucian Freud’s assistant from 1991 through 2011, and he is now director of the Lucian Freud Archive. He co-edited last year’s two-volume survey of the artist’s work published by Phaidon. He is currently preparing an exhibition of Freud’s self-portraits for the Royal Academy, London, in October. Dawson also continues to work as a painter in his own right. Lucian Freud (1922–2011) was one of the most significant painters from the postwar period through the first decade of this century. A grandson of Sigmund Freud, he was born in Berlin and moved with his family to London in 1931. He served in the British navy during World War II, and immediately after began working full time as a painter. Committed to figurative painting for the entirety of his career, Freud built a formidable reputation as a painter of portraiture. The work of Lucian Freud is represented in major private and public collections worldwide, including the Metropolitan Museum of Art and the Museum of Modern Art in New York; the Hirshhorn Museum and Sculpture Garden and the Smithsonian Institution, Washington, D.C.; and the Art Institute of Chicago as well as the Tate and National Picture Gallery in London; Centre Pompidou, Paris; and Museo Thyssen Bornemisza, Madrid; among many others.